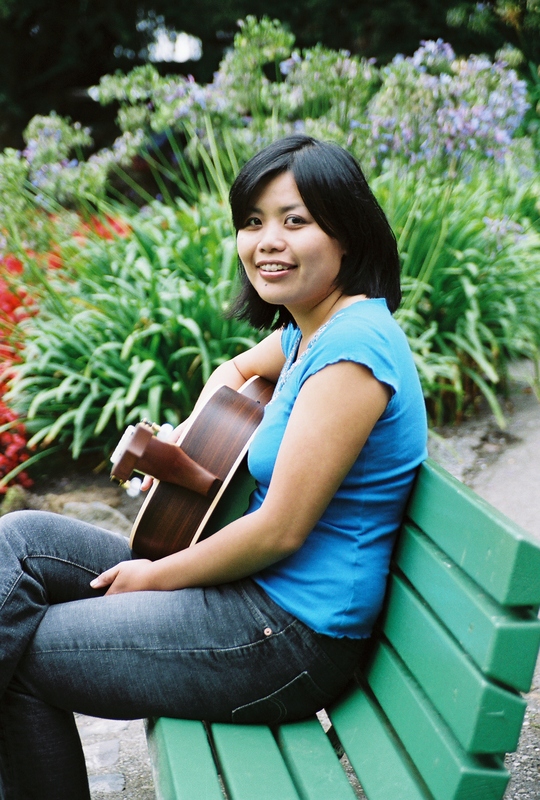 Singer/songwriter Frances Ancheta isn’t aiming for global stardom. The young Filipina acoustic-pop artist is instead simply wanting her gently rolling unplugged narratives to be appreciated, to find homes in the ears of listeners. Given that so many musicians today enter the field with MTV fantasies in their imagination, Ancheta’s modest ambitions are touching and reflected in their down-to-Earth pleasures of her debut album Now We’re Here. Kit Burns: Your music is acoustic but the influence of ’80s English alternative rock, especially Morrissey, is evident in your voice. Are these stripped-down arrangements really what you’re aiming for or do you dream of a full electric band? Frances Ancheta: The stripped-down acoustic sound is actually what I was aiming for, interestingly enough. Although I listened to all kinds of music, including alternative-rock bands, I was always drawn to their unplugged acoustic songs. For some reason I was fascinated by the fact that many of my favorite musicians started off writing classic songs with their simple instrument, their voice, and either a tape recorder or a pen and pad of paper. I always admired this ability to create something profound by doing something so simple. As far as a full electric band, I wouldn’t mind any collaboration in the future, but for now I feel like I can continue my development in acoustic arrangements. Burns: Growing up, what artists did you listen to the most that inspired you to write and sing songs? Ancheta: I listened to and enjoyed all kinds of music including old-school R&B, jazz/old standards, classical, reggae, flamenco, Hawaiian, folk, and above all the alternative/modern rock of the ’80s and ’90s – too many groups to mention! I loved the Smiths, the partnership of Morrissey and Johnny Marr was the ultimate songwriting combination of original lyrics and music that captured beauty, irony, and sadness all at the same time. I also enjoyed the Cure, Echo & the Bunnymen, R.E.M. I appreciated the songwriting talents of Neil Finn of Crowded House, who I admire for his skill and resourcefulness. As I got older I really was moved by Radiohead, Jeff Buckley, Joni Mitchell, Nick Drake, Ben Harper. I also enjoy Jack Johnson, Jason Mraz, and Norah Jones. Burns: Are you involved with the Filipino-American music scene in San Francisco? Ancheta: Yes, to a certain extent. I was born and raised in San Francisco so I’ve been able to witness the beginnings of a few Filipino organizations supporting Filipino American arts; for example, The Yerba Buena Pistahan Philippine American Arts Exposition, which I performed at last year, and Bindlestiff Studios. I know people who were performers, vendors, or organizers of the event. I try to be as supportive as I can with Filipino American events. However, I sometimes wish that these events would showcase more culture, history, and life for Filipino-Americans today. They try, but I’ve been seeing more often lately business/corporate-related booths such as the cell phone/cable company or a bank that happens to have Filipino staff representing the organization for that event. I still currently network with a few Filipino-American musicians I met during the open mike scene, including Olga Salamanca and Kapakahi, and I am happy for their success. In terms of trying to perform at various Filipino-run venues, my results have been mixed. I don’t think they quite know what to make of my sound at times, and they’re not sure how serious I really am. But for the most part my encounters with my fellow Filipinos have been positive. Burns: What are your goals with this CD? Ancheta: My goals were simple: To create a quality CD reflecting the crafts of good songwriting, artistic expression, and musicianship; to create a CD worthy of respect from appreciators of good music, something that I can be proud of. Burns: What influences your songwriting? Ancheta: Many things influence my songwriting. Personal experience is such a big factor; many of my older songs helped me to deal with past relationships as well as to sort out my direction in life. I’m a pretty introspective person, and for better or for worse I tend to ruminate on things a lot. Songwriting helps me process my introspection at times and let things go. It helps me turn my negative feelings into something positive. In addition, my desire to understand other perspectives and points of view also influences my songwriting. In fact, some of the songs on the CD were based on imaginary situations and my interpretations of how certain people might be thinking or feeling. There were actually a few songs that I wrote for a friend’s unreleased movie, where I based the songs on characters in the screenplay. Most of all, a big influence is my desire and hope for the best to come; my belief that life will work things out in spite of all the ups and downs.